Well, I can’t quite help you there (hire a personal shopper, maybe?) but I can help you be that woman when it comes to running your business and making holiday sales this season. 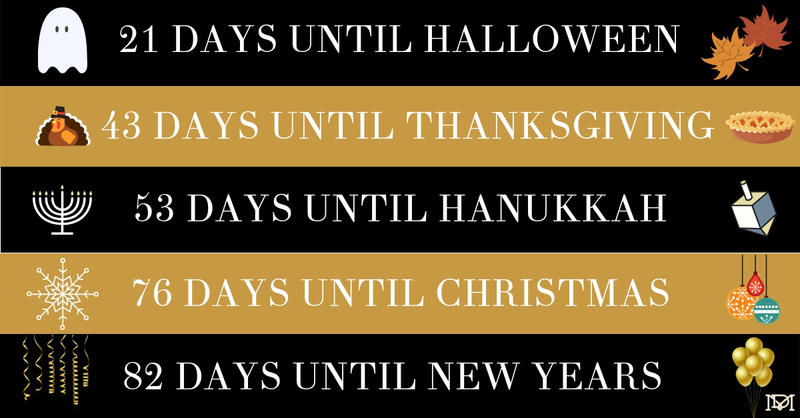 As of today, we have just 44 days to Black Friday; 53 days to Hanukkah, 76 days until Christmas, and 82 until New Year’s Eve. That means you have less than two months to put together your plan for holiday promotions and start executing. The key to running a successful holiday promotion is to start early, and the good news is that we’re here to help. I want to challenge you to make your life as easy as possible by joining us in a 7-day Holiday Sale Challenge. Click here to join now! All you have to do is simply follow along and complete the action items to get a solid head start on your holiday sales prep, starting today. Wait, do I have to run a sale? Still on the fence about jumping into all the holiday hoopla? I understand. Running a good promotion requires serious consideration, so first let’s work out of a holiday promotion is right for you. A promotion can and should be about so much more than just discounting unwanted inventory or slashing prices to see a short term spike in revenue. In fact, I would argue that those are the exact wrong reasons to hold a sale or promotion. Too many of those sorts of events can have a negative impact on your business and set your customers up to actually wait to buy until your next promotional period rolls around. Before you set out to run a sale or promotion, you must first have a strong reason why, and the holidays are, to put it bluntly, a good reason. Many people spend serious cash on both products and services around the holidays, they’re primed and ready to make buying decisions, and your competitors may also be offering promotions around this time. If that’s convinced you that a sale or promotion might be in your business’ best interest, join our 7 Day Holiday Sale Challenge and read on! Will you run a sale or promotion? A sale is when you discount the price of a product or service; a promotion is when you add something of value to the customer experience instead of a discount. Either can work when promoted well. How will you structure your sale or promotion? Will it be a straight percentage discount? Free shipping? A bonus with purchase? Buy one get one free? A donation to a cause for every purchase? Consider all the fine print “terms and conditions” now. Which products or services will you feature? Does the sale or promotion apply to everything, or just select products? What will your dates be? It may seem like Black Friday is a no brainer, but you may want to consider other dates as well. What about an early bird sale? A Cyber Monday sale? Or a last minute shopping sale? You don’t have to compete with the noise on Black Friday — unless you want to. Once you have these details figured out, the rest of your strategy falls into place much more easily. In fact, if you’ve made up your mind to run a holiday promotion this year, then I highly recommend join our 7 Day Holiday Sale Challenge now. In it, I’ll walk you through all the decisions and action steps you need to take to run a smooth and profitable holiday promotion.